Description: Custom built home in emerywood area situated on two lots (approx. 2+- acres) at the end of the street. Beautiful details like marble f/p surround & plaster ceiling ornamentation, 5 piece crown moldings, oak h.W. 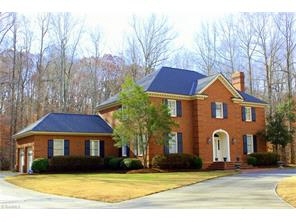 's and built on 16" centers w/tongue & groove, 10' ceilings, updated master bath, beautiful deck overlooking flat wooded lot. Cozy family room(w /fp )opens to deck. Beautiful staircase & foyer, built in bar & spacious rooms throughout. Ml master & ba. Great storage.Make the changes you'd like!